Gunmen killed two female employees of a university in Ukunda, near Mombasa on Kenya's Indian Ocean coast in a suspected extremist attack, a Kenyan police official said Tuesday. The assault occurred as President Uhuru Kenyatta campaigned in the coastal region for the rerun of presidential elections later this month. 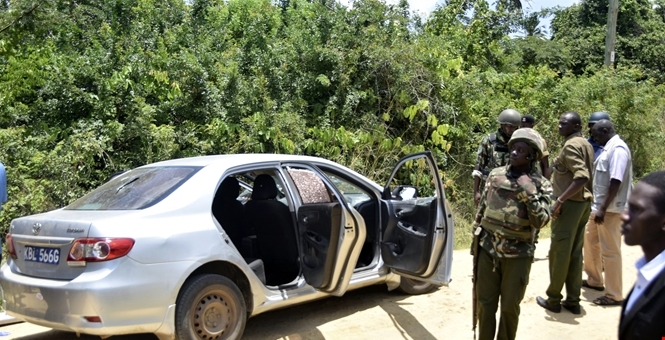 The gunmen suspected to be al-Shabab rebels from neighboring Somalia sprayed a vehicle carrying university staff and police with bullets near the campus, Larry Kieng, the region's police chief said. Ukunda is 31 kilometers (19 miles) southwest of Mombasa, Kenya's second largest city. Two women staff members of the Technical University of Mombasa were killed in the attack, said Mwangi Kahiro, acting county commissioner for Kwale County said in a statement. Students held demonstrations following the shooting condemning insecurity in the region. The attack recalled the April 2, 2015 attack on Garissa University in eastern Kenyan in which four gunmen killed 148 people, most of them students. Somalia's al-Shabab militia has been carrying out attacks on Kenya as retribution for Kenya's deployment of troops in Somalia to fight the rebels. Kenya's military said Monday it had gunned down five suspected al-Shabab militants in the Bodhei area of Lamu County. The military claimed the five were part of a group that has been terrorizing the coastal area. Al Shabab has claimed responsibility for 16 beheadings in the area since June and dozens of fatalities from roadside bombs. Kenya is one of six African countries that contribute troops to the African Union force in Somalia to fight al-Shabab which is waging an insurgency against the U.N.-backed government to establish a state based on strict Shariah law. Al-Shabab is the most potent threat to East Africa's stability, having regained territory in parts of southern and central Somalia and carrying out frequent attacks in Somalia's capital and in Kenya, according to the U.S. State Department's country reports for 2016. The 22,000 troops in the African Union force pushed al-Shabab out of most of Somalia's cities and towns but the rebels continued to hold territory in southern Somalia where the extremist group "gained time and space needed to grow regroup and recruit new fighters," said the report.